It’s been a while since I’ve done an ambigram, but I was feeling good about this one, so I thought I’d give it a go! Aside from the ambigram in the middle, this piece was a good excuse for me to continue with studying Copperplate styles, which is something I returned to last week. Copperplate is almost geometrically precise. The shape of the oval informs just about every letter of the script, and dictates the spacing of the letters too. An interesting thing you can do is to cover the upper part of any Copperplate word and see a funny little row of loops left, which form the lower halves of the letters. In the word “Feeling”, the loops on the underside of the E’s, L and I all form a row, and a little later, the second half of the N and the G, too. A curious side effect of this geometrical construction is that when it’s upside down, it almost looks like a word. It’s strange to try to figure out what the upside down “Feeling” should say. It almost starts with a B (though a true Copperplate B looks different to this), and is followed convincingly by a passable U. It’s from there that you have to do some typographical gymnastics to convince yourself of a possible N made from the I and L, or perhaps a P from the L and E. Either way, the good news is that this piece reads the same both ways up! I encourage you to do a handstand to see for yourself. Imagine trying to make ambigrams is like walking into a room with a million puzzles. All you know is that some of the puzzles can’t be solved and some can, but you have no idea what proportion is solvable or how hard they will be to solve. So you can just pick up some puzzles and try to solve them. Some of them seem like you can get somewhere, but then get completely stuck, and so remain only partially solved, and others look like they won’t work, but you find a surprising solution. Chances are that you, as the person put into this room, are not the best puzzle solver in the world, and that someone with more experience solving puzzles could solve the ones you couldn’t and solve them well, too. The problem is that barely anyone has ever tried any of these puzzles, and if they have, you can only ever find out if they succeeded, because they never tell you about the puzzles that they didn’t solve. Because of that, you can never know if a puzzle you failed at could be solved well. Some puzzles are a little more popular than most, and so you can look up solutions that people may have come up with, but in general, that spoils the game, and it’s much better to look up solutions only after you have solved it, or decided to abandon it and never return. That is what ambigramming is. Write the word the right way up on a piece of paper. Turn the paper upside-down and write it again underneath the other word. You don’t have to match them letter for letter, though it can help. Some letters are long or short, however, so matching an M with an I doesn’t really work. If you were doing the word “Mill”, you would probably want the M to cover the I, L & L, so don’t get stuck with doing a 1 to 1 configuration. Start trying to find ways in which you can change parts of the letters to look like the others without sacrificing their defining features. This is the hard part, and often seems impossible. Different letters tend to work better or worse with different styles. One letter combination may work very well in a Blackletter style, but not at all in a Copperplate style, or typographical style. Similarly, they can work in uppercase, but not lowercase, and vice versa. Sadly, sometimes, a whole word can work, but needs to have a mix of styles to do so, and so looks ugly and needs to be abandoned. Once you are lucky enough to find a solution to each letter pair/group, sketch it out several more times and refine it for legibility. At this stage, still, you may need to discard your ambigram, because it doesn’t ever look clean or legible. There is one big trick that you can use, which took me a while to figure out, and it relies on a peculiar way that the human brain works. Test it out yourself: Take a line of text. Any line from my comment, or any text you have lying around will work. Take a piece of paper and cover up the bottom half of all the letters. The sentence should still be readable, depending on the exact letters used. Now try the other way, and cover the top half, leaving the bottom half exposed. It should be a bit harder to read. A well designed typeface should leave you still capable of reading what is there even with the top covered. If you were to try it with some Copperplate, however, as we just discovered, all you might see with some words is a row of loops. The bottom half of the letters doesn’t give you much of a clue as to what the word is, but the top helps. With that knowledge, you can trick the viewer by making the top of the letters conform more to the target word than the bottoms. 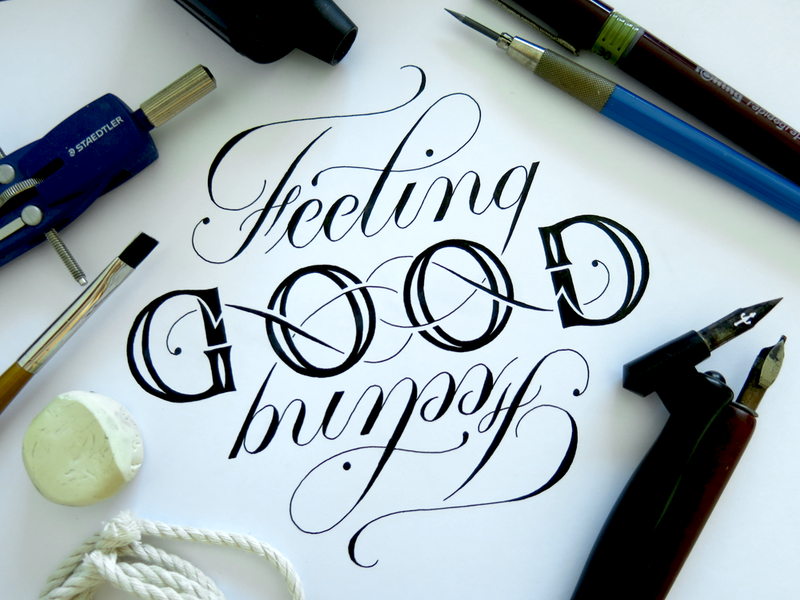 This entry was posted in Uncategorized and tagged Ambigram, Art, Calligraphy, Copperplate, Feeling Good, Fineliner, Hand lettering, Ink, Jack, Jack Standbridge, Lettering, Logo, Logo Design, Logotype, Rapidograph, Roman, Rotring, Script, Serif, Standbridge, Technical Pen, Type, Typography, Upside, Word art. Bookmark the permalink.